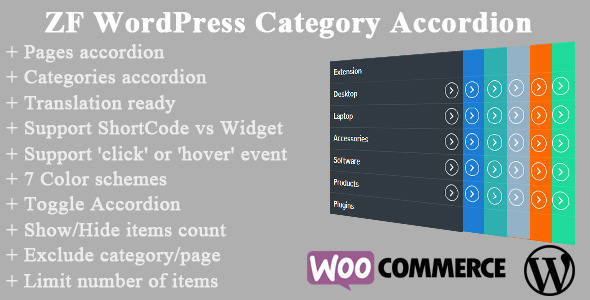 ZF WordPress Category Accordion plugin allows to show all categories as WooCommerce category accordion, WordPress category accordion, also support pages, WP eCommerce, Easy Digital Downloads, Jigoshop, MarketPress Lite. It supports shortcode vs widget with many options. So you can easily configure plugin to display what you want. It is fully customizable to display categories with 7 color schemes. of course, you also can add more existing colors. Support WP eCommerce, Easy Digital Downloads, Jigoshop, MarketPress Lite. Change speed when expanding/collapsing categories.